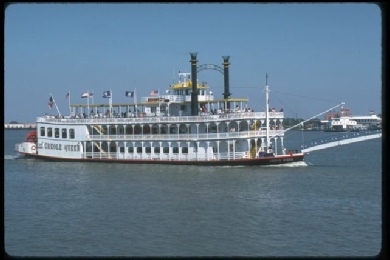 ﻿ New Orleans Louisiana, Travel Information, USA Travel Guides, State Parks, Tourism Video, Photos,Top Events, Calendars and things to do. Discover America! 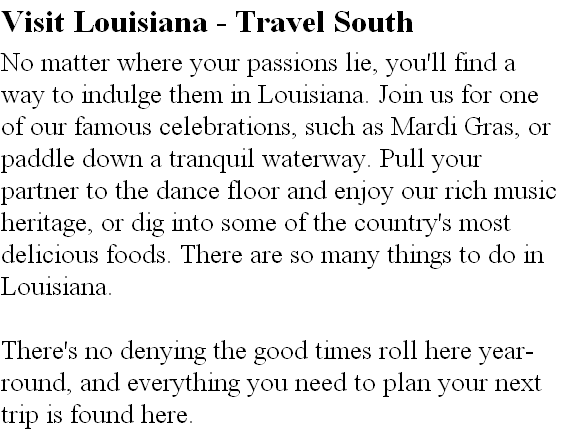 No matter where your passions lie, you'll find a way to indulge them in Louisiana. Join us for one of our famous celebrations, such as Mardi Gras, or paddle down a tranquil waterway. Pull your partner to the dance floor and enjoy our rich music heritage, or dig into some of the country's most delicious foods. There are so many things to do in Louisiana. There's no denying the good times roll here year-round, and everything you need to plan your next trip is found here. New Orleans, without a doubt, is definitely the Paris of the South. This is because, it is truly a southern gem, and also the biggest city in all of Louisiana. It is definitely the place to be, in order to celebrate Mardi Gras, in addition to a whole group of other festivals that the Big Easy is known for sharing with the world. 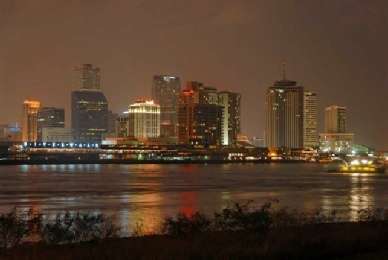 New Orleans is located in southeastern Louisiana and it straddles the Mississippi River. Not only is it Louisiana's largest metropolitan city, but it is also a major United States port in addition. La-Nouvelle Orleans began its history officially on May 7, 1718 and was founded by the French Mississippi Company. The French Mississippi Company was under the guidance of Jean-Baptiste Le Moyne de Bienville. The land on which this early city sat did belong to the Chitimacha. The city was named in honor of Philippe d'Orleans, who was Duke of Orleans, as well as Regent of France during this time period. 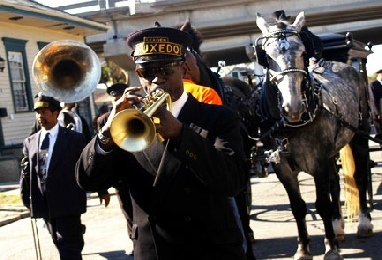 New Orleans is noted most for its out of this world cuisine, and is also the birthplace of jazz music, in addition to hosting various festivals and celebrations year round. The most famous of all these festivals is Mardi Gras. It has been dubbed the most unique of all American cities, due to its many attributes, which have only served to make it a place that many want to visit from here, there, and everywhere. Some of the most famous of all its attractions, as well as landmarks, do include the Vieux Carre' or French Quarter, Confederate Memorial Hall, City Park, the Garden District, the Audubon Zoo, the list goes on and on. New Orleans is also a very unique city where the old combines very well, with the new, and this is very much alive in the architecture that makes the city unique and world-famous.